Long grains of rice interspersed with colourful and chunky veggies, and lusciously flavoured with coconut milk and red curry paste. The ultimate touch to the Babycorn and Mushroom Curry Rice is the addition of lemon rind and basil leaves, whose aroma is indelibly locked in by cooking the rice wrapped in a banana leaf. You could well call it ‘phat-a-phat’ fried rice, as this sweet and sour thai rice preparation can be readied in a jiffy with leftover rice. With colourful veggies and tangy sauces, the chatuchak fried rice is a meal you will enjoy! An innovative fruity vegetable rice cooked in coconut milk, Thai layered rice is a Thai cuisine specialty. A healthy mix of fruits, veggies with aromatic rice, the layered rice looks appealing and taste awesome. 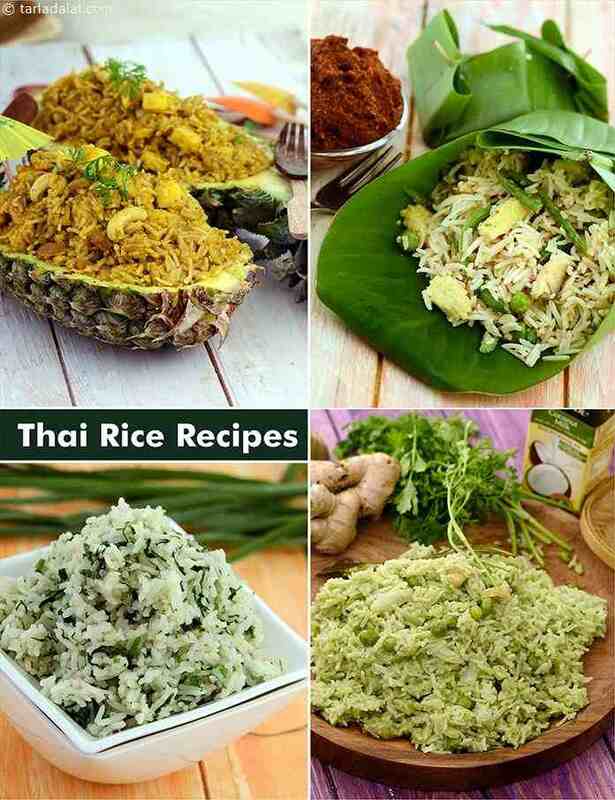 Chatuchak rice is a Thai fried rice recipe with long grain rice stir fried with vegetables and flavoured with authentic Thai cuisine herbs and ingredients. A very different and unusual rice made in coconut milk, with fenugreek seeds adding to the taste and health. A perfect rice dish for elderly people, due to its high fiber and iron content. Very good in diabetes. .